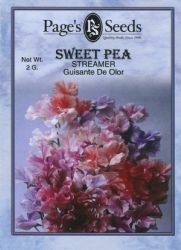 Sweet Peas are ideal for cool climates and one of the most fragrant of annuals. Streamer colors are striped with white "flakes" throughout the flower. The exquisite blooms begin mid-summer from seed sown in early spring in multi-shades of lavender, pink and scarlet.